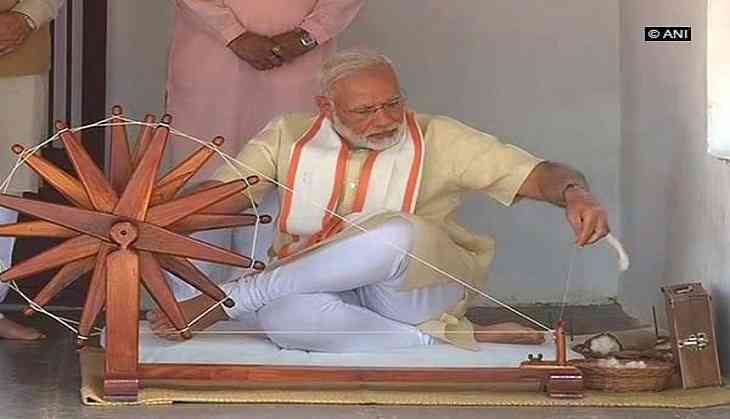 Prime Minister Modi on Thursday began his two-day visit to his home state Gujarat to participate in the centenary celebrations of Sabarmati Ashram. He earlier today landed in Ahmedabad and then addressed the party workers outside the airport. While addressing the party workers, the Prime Minister said that it was after the Supreme Court's judgement and formation of the BJP government in the Centre that the implementation of Narmada Yojana has taken place. "Taking Narmada waters to the water scarce Saurashtra region is in itself a very big achievement," said the Prime Minister. Later on, he visited the Sabarmati Ashram. This is Prime Minister Modi's fourth visit this year to Gujarat where assembly elections are due by the end of this year.